Each custom piece follows a variation of the following steps. I will use the creation of “Hear the Word, Do the Word” as an example. Initial contact. This is simply a conversation by phone, email, or in person that establishes mutual interest and expectations. I explain my design process and discuss my fee system. Interview. In the example I met with a committee in their church building. 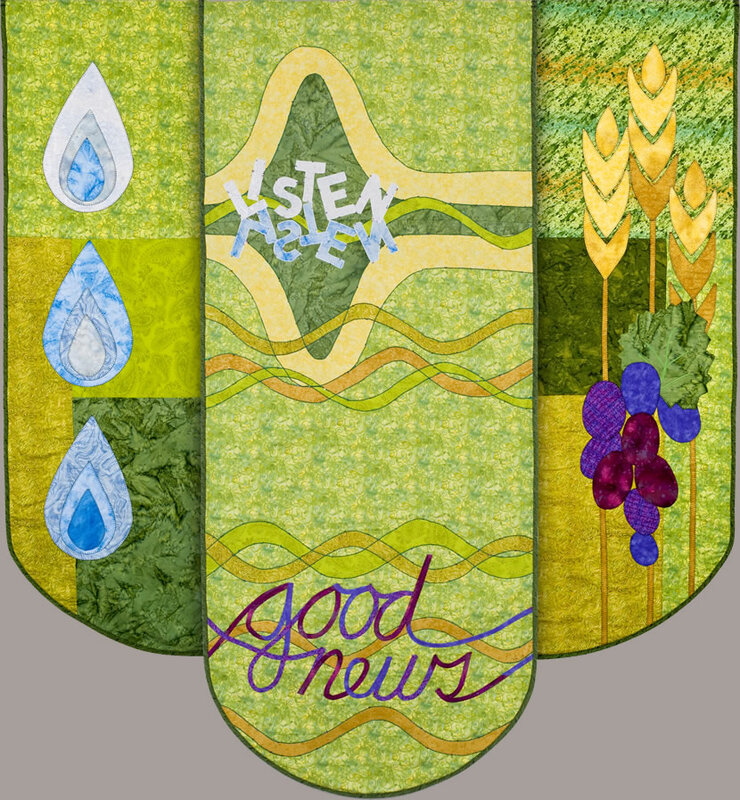 They shared the concerns that banners compliment the stained glass windows, fit in the existing mechanism to display banners, and conform to the limits of their storage system. We had a lively discussion when I asked them to describe their congregation. They were enthusiastic about the focus on word and sacraments and the variety of outreach and service. At the end of the interview, I had an amazing list of what they do. I measured the physical spaces before leaving the building. I asked for about a month to develop a design and collected a design fee. Design. Mulling ideas over morning coffee is often the initial step. In this case, as I reviewed the interview, the song Listen, God is Calling interjected its presence. 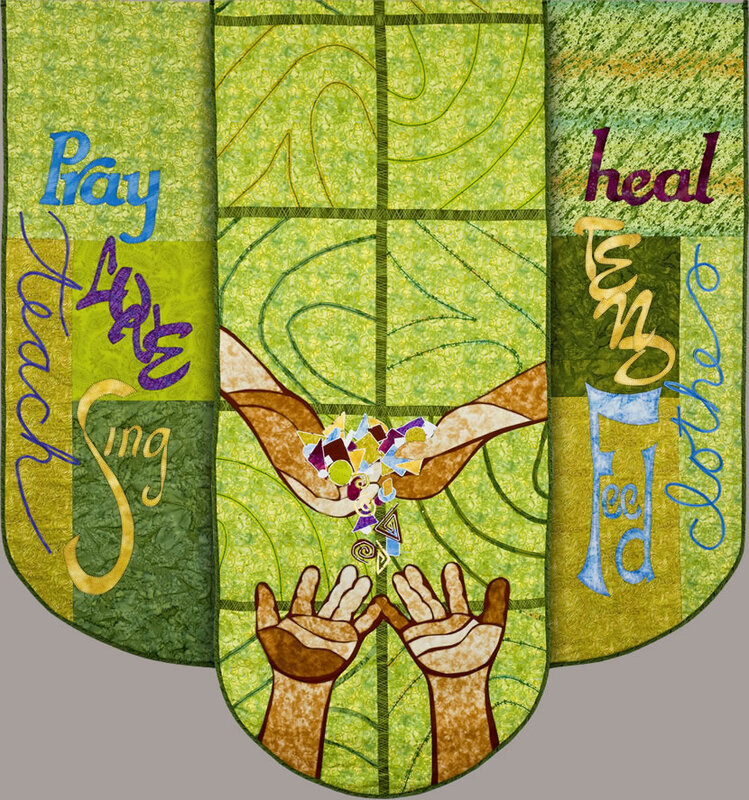 The concept for the banner became the interweaving of the committee’s description of congregational life and this hymn. I chose a simple color palette and prepared a color story board. I drafted a three panel arrangement to scale and played with motifs representing the earthly elements of the sacraments and with verbs taken from the interview. The rectangular piecing of the side panels echoes the shape of the stained glass windows. I used curved lines in the center panels to suggest sound waves for “hear” and fingerprints for “do.” I made scale drawings to show the arrangement of the design elements. Presentation. I met again with the committee, presenting the design rationale, the color story board, the sketches, and a contract which included cost and time for completion. We had the time to discuss concerns and delights about the design. We reviewed the conditions of the contract. At the conclusion of the meeting, the contract was signed and a deposit to cover initial costs and labor collected. Production and Delivery. What I call studio magic, or the pain and delight of production, results in a product true to the concept but usually containing some creative surprises. Upon completion, I notify the recipients, make arrangements for delivery, and collect the balance of payment. This entry was posted in Art for Sacred Spaces, Works of Art by norma17. Bookmark the permalink.